Figure 2-2. - CESO drawing number. A Revision block contains a list of revisions made to a drawing. The Revision block is in the upper right-hand corner. Drawing revisions to NAVFACENGCOM project drawings are to be made according to DoD-STD-100C. The Revision block may include a separate "PREPARED BY" column to indicate the organization, such as an A/E firm, that prepared the revision. Like title blocks, revision blocks may vary in format with each command. Graphic scales are in the lower right-hand corner of each drawing sheet with the words Graphic Scales directly over them. The correct graphic scales must be shown prominently on each drawing, because as drawings are reduced in size, the reductions are often NOT to scaled proportions. Remember, scaling a drawing should be a done as a "last resort." Because of the small scale used in most drawings, standard graphic symbols are used to present complete information concerning construction items and materials. These typical symbols are used so frequently in construction drawings that their meaning must be familiar not only to the preparer, but to the user as well. The main information sources for a particular symbol are the Military (Drawing) Standards (MIL-STD) and the American National Standards Institute (ANSI). Refer to these standards before you use other references. The following is a list of the most commonly used military standards. As a Builder, you will find that your knowledge of the applicable symbols will assist you greatly in doing the job correctly and promptly, and above all, with confidence. In figure 2-3, symbols are used to identify sections, elevations, and details that are commonly misinterpreted. Some of the basic architectural symbols, as shown in figure 2-4, are commonly found on site or plot plans. 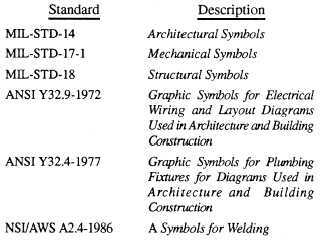 Structural symbols are shown in the NAVFAC P-405, the Steelworker, vol. 1, and the Engineering Aid Basic. NOTES are brief, clear, and explicit statements regarding material use and finish and construction methods. Notes in a construction drawing are classified as specific and general. SPECIFIC NOTES are used either to reflect dimensioning information on the drawing or to be explanatory. As a means of saving space, many of the terms used in these notes are often expressed as abbreviations.